Walking not only gets us from point A to point B, but it's also free and easy exercise without limitations — and a brisk pace can strengthen muscles, prevent disease and enhance wellness. We walk to the store from our car with a baby on our hip. We walk to our office building Monday through Friday. We walk to the mailbox with our dog on a leash. Why not walk yourself into a fun walking exercise regimen? Just because we rely on water every day to hydrate doesn’t mean we can’t add cucumber and a pinstripe straw to enjoy s a refreshing, cool beverage. Keep reading to learn how you can be fit and have fun just by putting one foot in front of the other. Health coach Andrea Metcalf recommends a walking program with variety. Walking forward with one foot in front of the other is the most traditional way to walk. Move briskly, point your toes forward, push off the ball of your foot, and keep your arms moving to create cardio and raise your heart rate. Metcalf explains you’ll engage the backside and glute muscles. You’ll also help reduce back pain because of a stabilized pelvis and hip extension. Side stepping: Step to the side with your left foot and meet your right foot together with your left. Repeat with your right foot, and open up the hips. Grapevine: Step to the side with your left foot and crossover over with your right foot. Repeat on the right side. Backward walking: Walk backwards at a quick pace, using your arms for balance. Make sure to look behind to see where you’re going. The American Heart Association spotlights walking for physical activity because of its low dropout rate and simplicity as a positive health change. Walk for at least 30 minutes each day. 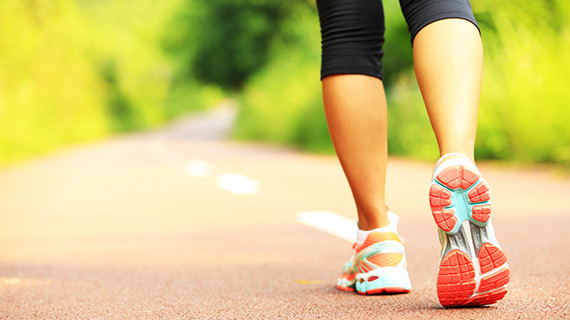 To boost your fitness, make it a goal to walk two miles at a fast pace as close to every day as possible. Make sure your walking is vigorous on a moderate to intense level. If your busy day doesn’t permit an open window for 30 minutes of walking, take shorter walks throughout the day. Use walking as a time for catching up with a friend or freeing your mind outdoors. Walk your dog, walk while pushing a stroller or walk to music. Just keep moving!